If you love homemade pastry, you’ll want to stick around for this one. 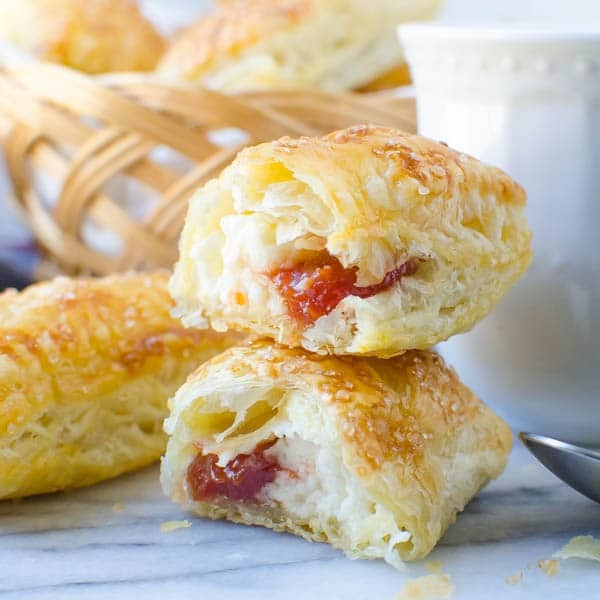 Apricot Almond Fruit Pastry is tender, sweet and irresistible. 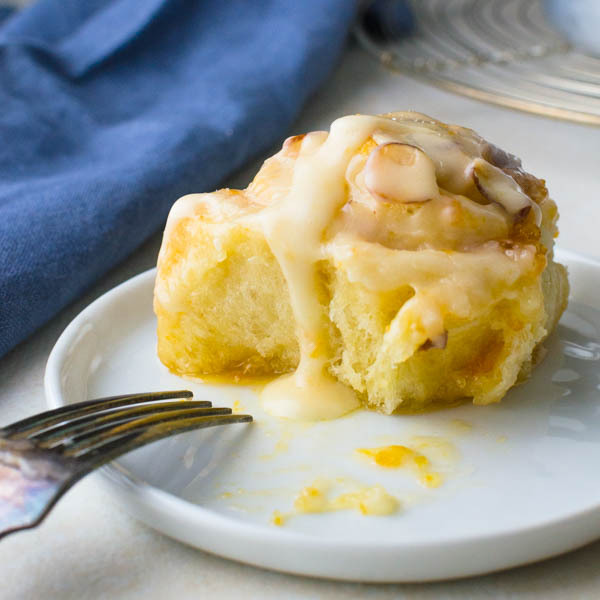 In no way do I consider myself to be a pastry chef — so if I can do it, so can you, and if you love breakfast pastry, then this recipe needs to be on your to-do list. These sweet yeast rolls will make any occasion special. I used my stand mixer to mix and knead the dough — but it’s not required. You can absolutely do this by hand — you’ll just have to use a little more muscle. The dough rose up beautifully, but even more importantly, it behaved while I rolled it out. There was no sticking to the counter, not fighting every step of the way. No, this homemade pastry dough was cooperative. I appreciate that — and so will you. 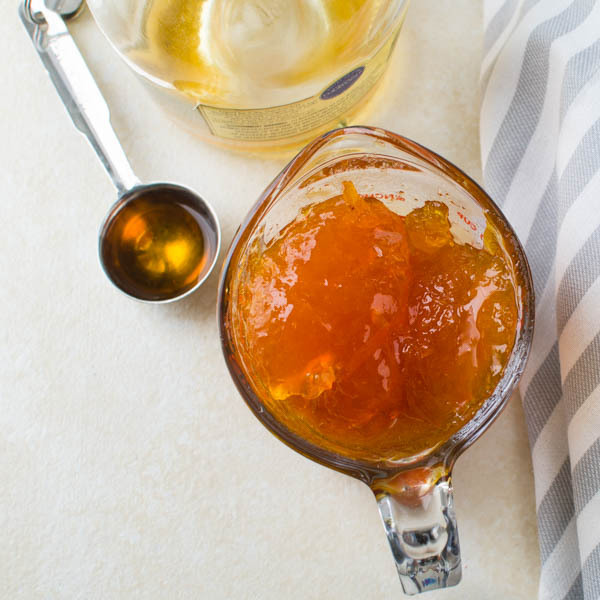 Add apricot jam to a glass measuring cup. Microwave in bursts until it’s a pourable consistency. Stir in the cognac and almond extract and set aside. Spread the softened butter over the rolled out dough. Top the butter with the apricot jam mixture and spread evenly, leaving a half inch border around the edge of the breakfast pastry. After the butter and jam are spread over the dough, roll it up into pinwheels. Start with the long edge and roll the dough over so that it’s firm, but not tight. You don’t want the filling to ooze out. When you’re finished rolling, use a sharp knife to cut into one inch pieces. Arrange in baking pans. I used two different sized pans, but you can use a 13 x 9 or two 9″ round cake pans — just space them evenly in the pan and give a little room for them to rise a second time. If you want to bake the rolls now, cover with a dish towel and let the sweet yeast rolls rise, then bake. However, you can also make the pastry up to this point and refrigerate it overnight. The next day, take the dough out of the fridge and let it rest for two hours (first hour to come to room temperature and the second hour to rise.) Then bake them off as usual. 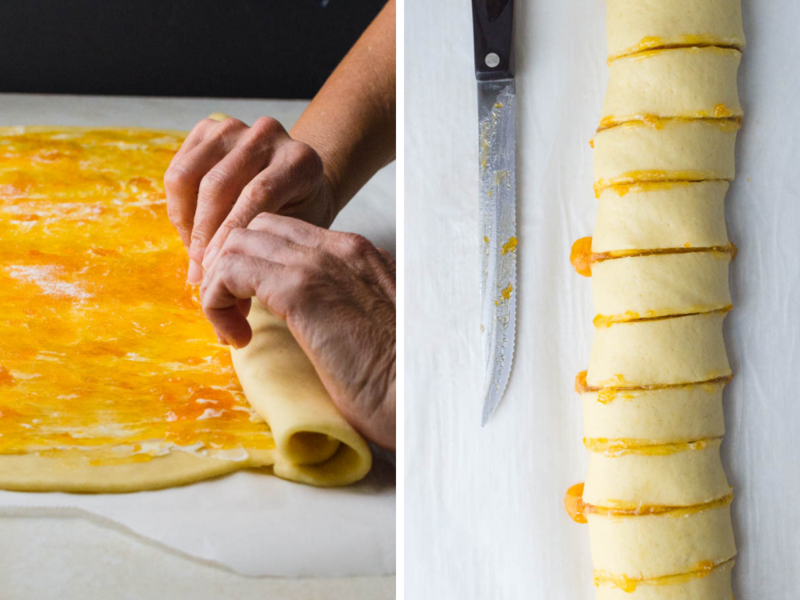 Imagine that, homemade pastry on a weekend morning — and you don’t have to get up in the middle of the night to make it happen! 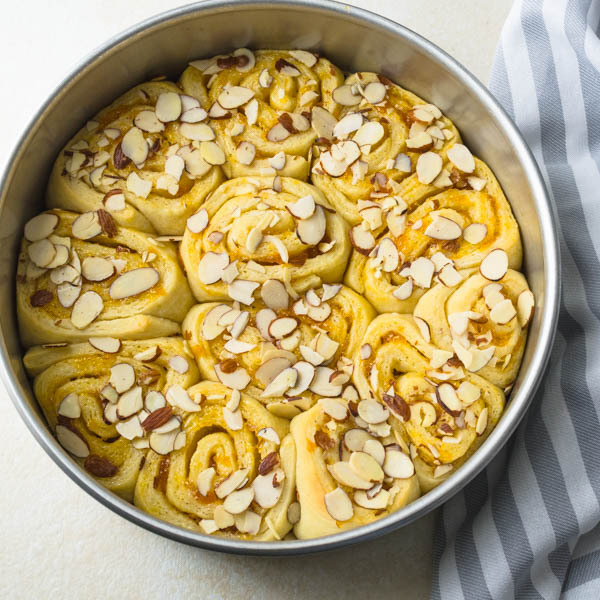 Just before baking, sprinkle the sweet yeast rolls with sliced almonds for a little texture and crunch. 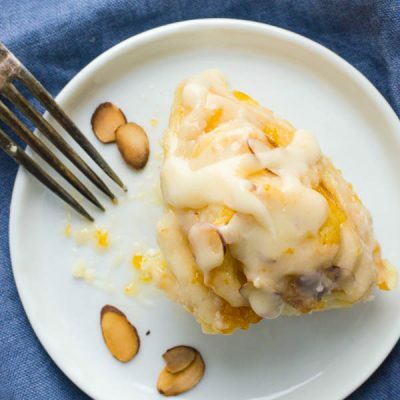 No sweet yeast rolls would be complete without a gooey glaze and this one is as simple and delicious as you can imagine with powdered sugar, half and half and a little of the filling from the apricot almond fruit pastries… #doesntsuck! 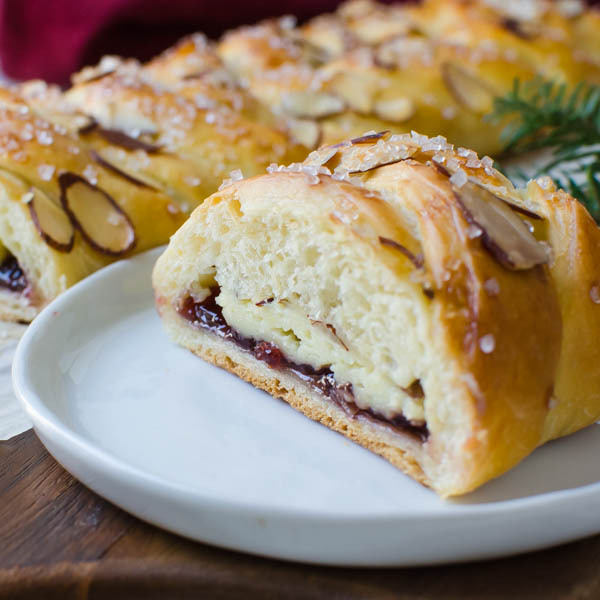 If you’re looking for a good breakfast pastry for Christmas or Easter morning — or you’re just in the mood for something special on any given weekend, try this easy recipe… and enjoy. In a large mixing bowl, combine the flour, sugar yeast and salt. Place the butter in a glass 1-cup measure and microwave in 30 second bursts until butter has melted. Whisk the buttermilk into the butter. This mixture needs to be between 105°- 115°F BEFORE ADDING TO THE FLOUR MIXTURE. If it's too cool, heat it in 5-10 second bursts. If it's too hot, let it cool to the proper temperature. Too hot and you will kill the yeast. 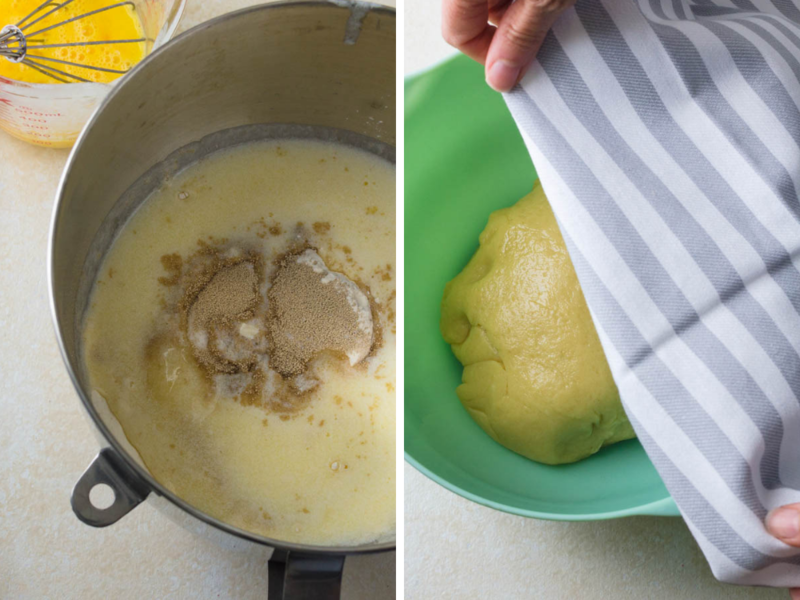 Note, you can do this by hand if you start with a wooden spoon to mix and then use your hands to knead and combine -- it will take about twice as long to get it to the smooth/elastic stage -- but it's a great arm workout! Turn the oven on to 250° for 5 minutes, then turn off the oven. Oven should be warm but not hot. Lightly grease a large bowl with vegetable oil. Transfer the dough to the bowl, flipping once to lightly coat. Cover the dough with a clean dish towel and set in the warm oven to rise until doubled in volume, about 1 1/2 hours. While the dough is rising, remove the butter from the refrigerator to soften -- it needs to be spreadable for the filling. If the apricot preserves are chunky, place them in the bowl of a mini food processor and pulse until smoother. Place the preserves in a glass measuring cup and microwave in 30-second bursts until thin and liquidy. Add the cognac and almond extract to the apricot preserves and whisk together until well combined. Set aside. Spray two 9"- cake pans with vegetable spray and set aside. Drop spoonfuls of the softened butter equal parts over the rectangle of dough. Use an offset spatula to spread the butter into an even layer over the dough, leaving about a 1/2" - 3/4" border edge uncovered. Drizzle the 3/4 cup of the apricot mixture over the dough and spread evenly over the butter, again leaving a 1/2" - 3/4" border edge uncovered. 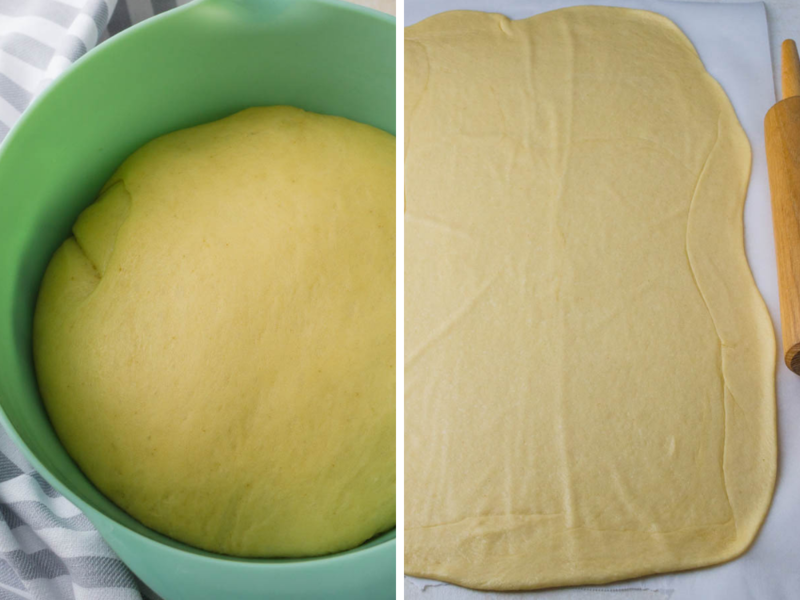 Roll the dough into a firm, but not too tight (you don't want the filling to ooze out), cylinder or pinwheel, starting on the wide end of the dough. You will have a 26" log. Trim the rough edges from either end and discard. Cut the dough equally with a sharp knife into 16-20 pinwheels. Transfer the sweet rolls to the prepared baking pans with the pinwheel design facing up. Cover with a dishtowel and let the dough rise again, about 1 hour or until almost doubled in size. Remove from the oven and sprinkle with sliced almonds. After putting the rolls in the pan, cover with plastic wrap and transfer to the refrigerator. The next morning, take the rolls out of the refrigerator and let them rise for 1-2 hours. Then continue with the baking instructions. In a small bowl, combine the powdered sugar and half and half. Heat the remaining apricot mixture in the microwave for 20-30 seconds until liquidy. Pour the apricot mixture into the glaze and stir well to combine. When the rolls are done, remove them from the oven. Let them sit for a few minutes before pouring the glaze over the top of the still warm rolls. Serve hot from the pan. 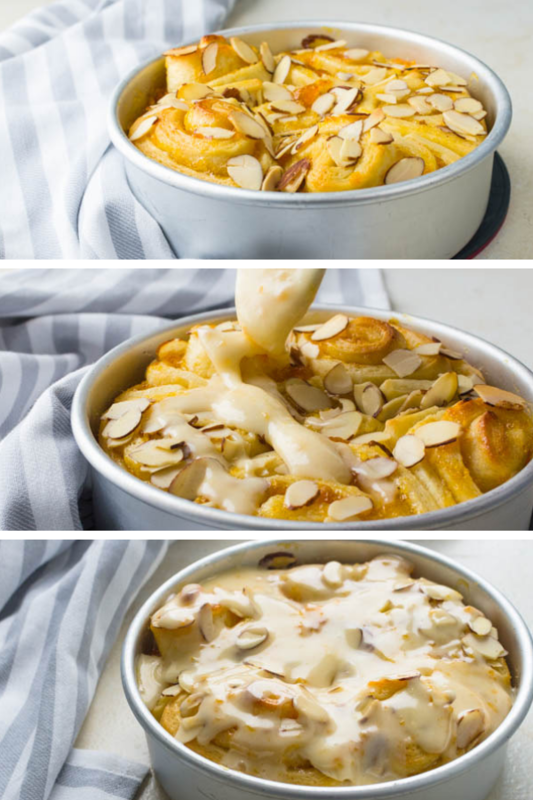 Pin “Apricot Almond Fruit Pastry” For Later! 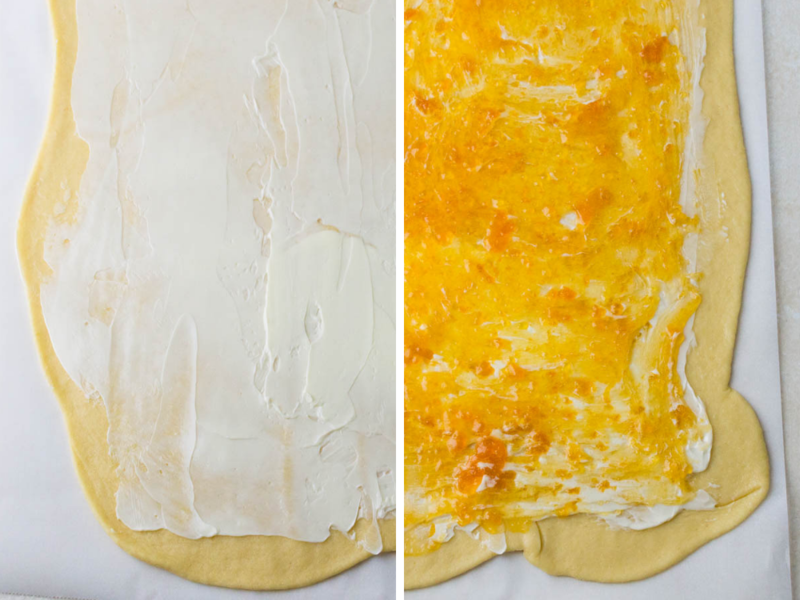 Apricot and almond is one of my favorite flavor combinations, especially in pastry! That glaze on top is making me want to jump into my computer screen. I haven’t had breakfast yet, and my day would be made so much better if one of these beautiful rolls was on my plate, with my cup of tea. Perfect for overnight guests during the holidays, too! Yessss! I love a good homemade sweet dough. The apricot filling is such a fun, different touch to the rolls. I’ll have to give it a try for the upcoming holidays! I love homemade yeast dough! 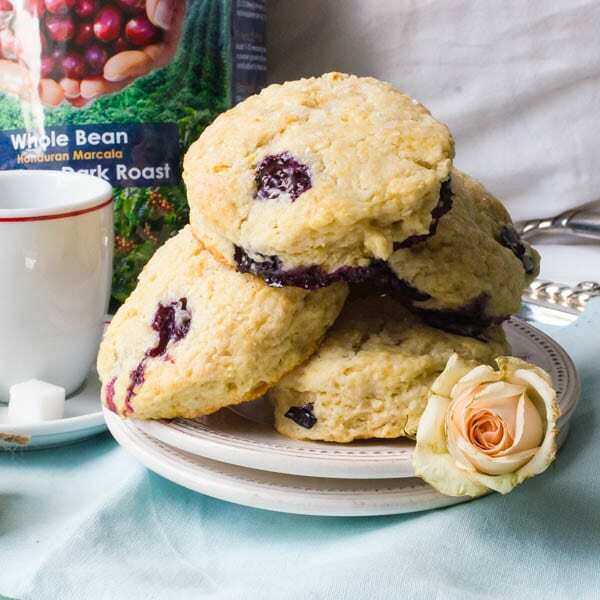 The aroma is wonderful and I love the filling that you use. I know that our family will enjoy these rolls with our homemade sausage patties. This will be a fantastic switch from the traditional cinnamon rolls. I’m saving this recipe. 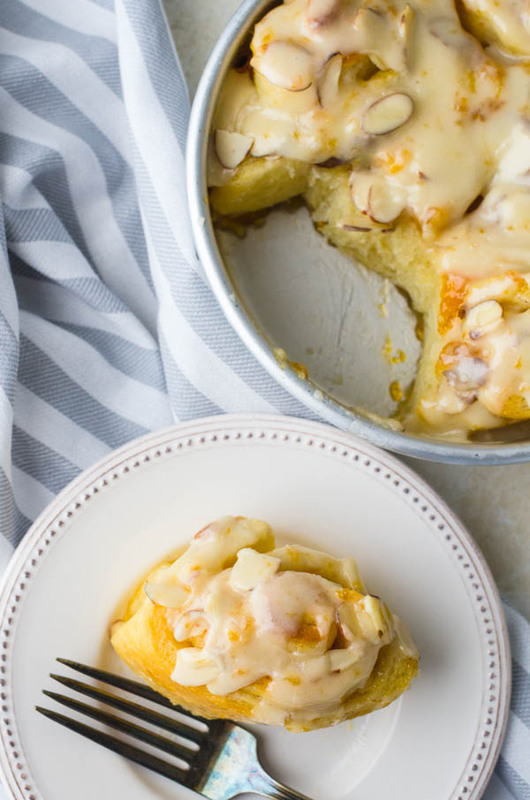 What a heavenly dish to make for holiday breakfast or brunch! I love the simplicity of the combination of the apricots and almonds. I haven’t made a pastry in a while either, but your recipe has me convinced I definitely should! My crew would love this! Glad you like it Tina — this went over BIG with my family and friends. YUM!!! I can’t wait to make these for Thanksgiving morning. They have all the good stuff we love. Apricot plus almonds…and they are gorgeous too! Thanks for the clear directions on that yeast dough….doesn’t look too difficult. I”m in! Oh heck yes please! These are absolutely stunning! Love the pairing of apricot with the slivered almonds. I’m actually the same with breakfast pastry. I don’t trust myself enough because I don’t bake very often! But I did manage to successfully make cinnamon rolls last year and it was my first time, so I’m definitely going to have to put my big girl pants on and bake these gems. I’m generally super intimidated by doughs that need to rise, but I’ve been watching a lot of Great British Bakeoff and I’m feeling inspired lol. These look so good- and your dough wasn’t sticky-looking at all!! (That’s the worst thing for me.) My husband loves rolls like this– I need to try making them for him! If this is a once in a 22 year breakfast pastry, it MUST be good! I love the combo of the apricot and almond – I just discovered that my little one LOVES apricots so I’m on the hunt for all the things I can make with them. Pinning! You’ve got me drooling at the screen! This apricot dessert looks so delicious and it is perfect for this holiday season! I’m not a fan of making my own dough but you may have convinced me to put in the work with this recipe. I feel the same way about pastries. I almost feel like a pastry fraud, in some ways I am. I use puff pastry sheets a lot;) Apricots and almonds has always been a great combo IMO and your breakfast pastry looks amazing. I bet it filled your house with all of the good smells. Will definitely have to make this. Darling daughter is coming into town, it will be super fun making this with her. 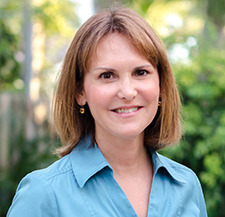 Thanks for this recipe Lisa! I love a good puff pastry, but these sweet rolls benefit greatly from the homemade dough. Hope you enjoy, Tina. 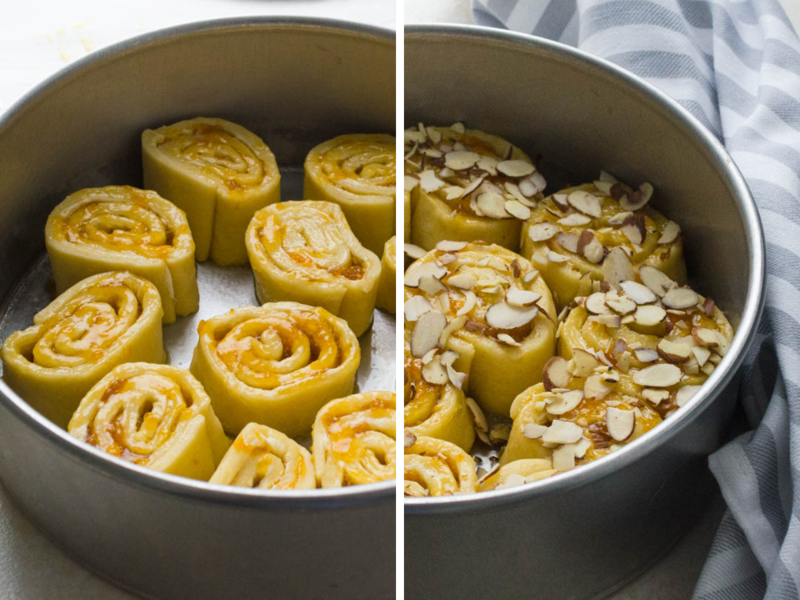 Omg these apricot rolls look and sound absolutely amazing! I wish I had one right now with a cup of tea, yum! Thanks, Diana! They are really good! Sounds amazing and looks like such a fun recipe to make! These look A-mazing!! This will be a family favorite for sure in my home! These look perfect for a breakfast treat this weekend! Yum! I would love to have those for breakfast tomorrow!! I usually cheat and use puff pastry! I love puff pastry, but you really can’t beat a soft, sweet yeast dough. With all the holiday get-togethers happening soon, this recipe looks great for brunch. Everyone loves sweet buns, and this is a nice change from traditional cinnamon buns. I would love these with my coffee any morning, so I guess I would have 2 batches. One for the guests, and one for me!! What a gorgeous pastry – with my favorite fruit! I absolutely will make these and may not wait for a holiday! Thank you, I’m so glad you like them. You will have to make them yourself, because we don’t have anymore!! !